Since 2010, ILRI and its partners in the public, private and non-profit sectors have pursued a comprehensive research agenda aimed at designing, developing and implementing market mediated index-based insurance to protect livestock keepers from drought related asset losses, particularly those in the drought prone Arid and Semi-Arid Lands (ASALs). For pastoralists whose livelihoods rely solely or partly on livestock, the resulting high livestock mortality rate has devastating effects on asset levels, rendering them among the most vulnerable populations in Kenya and Ethiopia. To effectively introduce index-based livestock insurance products to pastoral and agro-pastoral populations to help them manage drought-related livestock mortality. Understanding its possible role as a productive safety net within a larger social protection program. The initial pilot phase of the project in 2010, which included extensive field work and stakeholder consultation, generated useful insights. These were used in the design of the index-based livestock insurance (IBLI) products, better targeted to the needs of pastoralists; the target clientele. In October 2011, UAP Insurance Company and partners disbursed indemnity payments to policyholders in all five divisions of Marsabit District of Kenya. This was the first payout since the launch of the pilot in January 2010.Following a drought in 2012, the index triggered another payout in two divisions of Marsabit in March 2012. Subsequently, in July of 2012, IBLI was launched in the Borana zone of southern Ethiopia in partnership with Oromia Insurance Company (OIC) as the underwriter . 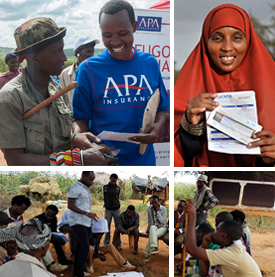 Further partnerships came to fruition in 2012 with underwrites like APA Insurance Ltd. going into Marsabit and Isiolo County in Northern Kenya and Takaful Insurance of Africa coming on board in 2013 to offer a sharia-complaint IBLI product in Wajir County for the August/September sales window. Mercy Corps is our partner on the ground for technical and logistical support in Wajir County and similarly World Vision Kenya continues to support us with technical and capacity backstopping in Isiolo County. For the August/September sales window of 2013, contracts were also sold in Wajir and Isiolo. From 2012, the development of a cutting-edge econometric response model by the IBLI team at ILRI enabled expansion into new areas by identifying the relationship between the Normalized Difference Vegetation Index (NDVI) and livestock mortality. While there are several examples of indices used in index-insurance pilots across the world, using a satellite derived indicator of vegetative vigor, the Normalized Differenced Vegetation Index (NDVI), was a natural choice of index for our IBLI product for several reasons. First, livestock in pastoral production systems depend almost entirely on available forage for their nutrition, and NDVI serves as a strong indicator of the vegetation available in the area for the livestock to consume. Secondly, NDVI fits a number of the prerequisites required for a data source to serve as an insurable index: it is cheap (in this case free) to procure; neither the insurer nor the insured can feasibly manipulate it; it is an objective measure; and it is auditable. That said, IBLI underwent a shift from an asset replacement to an asset protection contract, as the program scaled up to areas without sufficient livestock mortality data to estimate a statistical response function. This means that the index has evolved to rely exclusively on NDVI data — NDVI readings over an insurance unit and across a season are averaged, aggregated and standardized across time to derive the index. The index can be defined as a measure comparing the total amount of forage available across the contract season with the historic average forage availability of that season. It measures the forage condition over a defined time period and it is calculated by using a measure of pasture availability that is recorded by satellites (NDVI). The index compares the observed NDVI over a particular season, with the observed NDVI over a given historical period. Furthermore, with constant lessons being learnt from the ground, emphasis has been put on creating “informed demand” which means a stronger and better staffed Market and Capacity Development Team that can implement trainings and design capacity building activities that are appropriate to the needs of pastoralists, that improve understanding about IBLI and insurance, and that create sustainable and positive demand for IBLI in pastoral areas. With such resources now on board, IBLI has expanded to Mandera and Garissa Counties of Northern Kenya in January 2015 through Takaful Insurance of Africa. IBLI also plans on continued expansion to Turkana and Samburu counties later in 2015. Moreover, the IBLI Team has partnered with the World Bank Group and the Government of Kenya to launch the Kenya Livestock Insurance Programme in August/September 2015, which will offer limited livestock insurance contracts to targeted individuals in Northern Kenya with possible subsidies to the general public in later years. The Kenya Livestock Insurance Program (KLIP) is essentially a scaling-up of the IBLI product, made possible through ILRI’s partnership with the World Bank Group and the Government of Kenya (GoK). It is important to note that IBLI (ILRI’s micro/individual coverage) will still be sold on a commercial basis across Northern Kenya and it remains a separate product. i am a student at the university of Nairobi pursuing actuarial science. i am doing a project about how to price premiums for livestock insurance. the idea of index-based livestock insurance is new to me at the moment but from your article i see its better. i would like to get more information about it n if possible kindly let me know how to do it if its possible. you can send me a mail. i will greatly appreciate your help. Can you please send/mail me films and Documents on Index Base Livestock Insurance Programs to understand the technical and financial aspects better. Can someone explain how this works… I do understand about insurance generally but it is not exactly clear how in this specific case of index-based livestock insurance affects the pastoralists or even how they could gain from it. How will you engage the pastoralist and will other livestock keepers outside the pastoralist areas be accommodated?